Vinny Dotolo and Jon Shook (aka Two Dudes) quickly made a name for themselves with Animal, their temple to over-the-top rich simply delicious flavor. Since then the two have discussed a veritable laundry list of ideas including a sandwich shop, seafood restaurant, and even a BBQ joint. Today they finally realized one of those ambitions with the long-awaited Son of a Gun. Focusing on seafood, the term Son of a Gun comes from British naval slang and refers to "a child of questionable parentage conceived on the gun deck." Reflecting the incredible anticipation surrounding the restaurant, the reservation line opened at 2:00PM and by 2:45PM the restaurant was booked solid for the whole week. 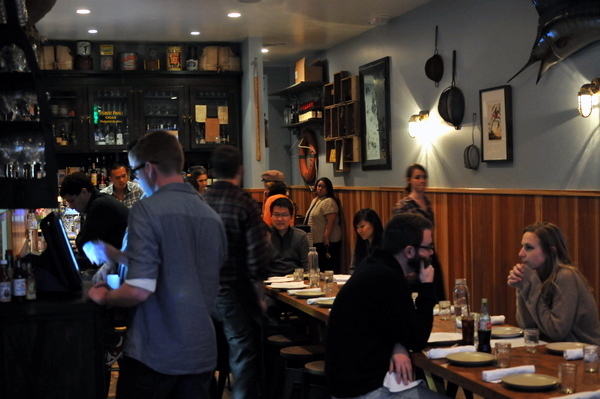 Fortunately I was able to snag one of the 27 seats reserved for walk-ins, 22 at the communal table and 5 at the bar. 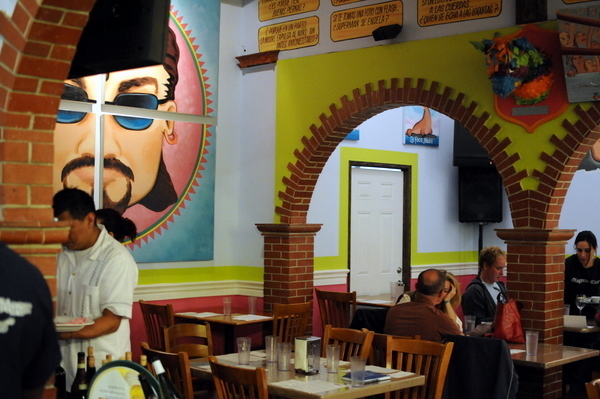 The whole restaurant has a casual feel, that reminded me of a neighborhood restaurant in a fishing town. 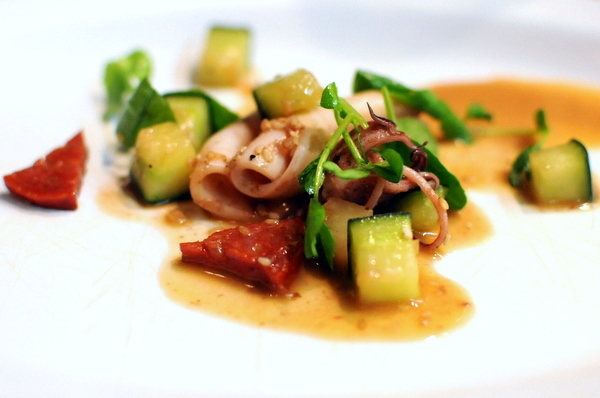 A solid start to the meal, the squid itself feels tighter and less slick than other preparations giving the meat a palpable snap. Meanwhile the Garbanzos add a slight sweetness and countervailing starchy heft. 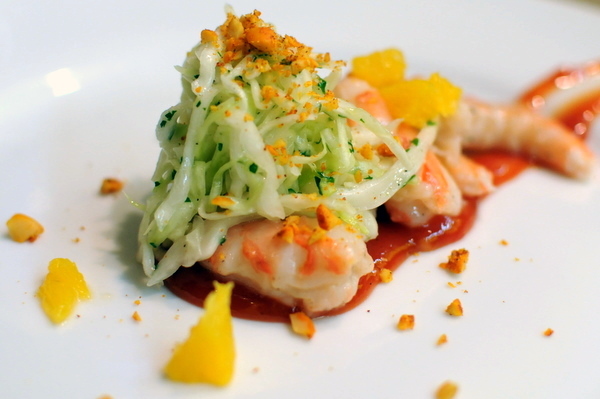 A spicy and tangy sauce rounds things out providing a lovely flavor profile to the dish. 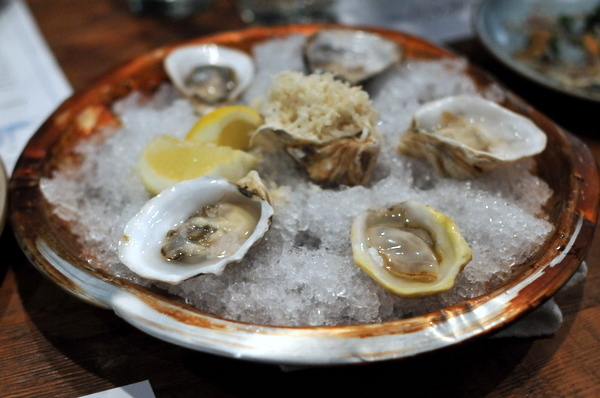 Nothing out of the ordinary here, the plump briny raw oysters come with classic condiments: horseradish, cocktail sauce, and mignonette. I was curious how the sardine and habanero would pair; it turns out they work remarkably well together. The fish provided a shock of tart fish oil subtly sweetened by some unidentified element. The habanero was quiet at first but provided a creeping heat that gradually superseded the fish. This was the first of three consecutive "sandwich" courses that would all prove stellar. The aioli soaked lobster is enjoyable slightly tangy and creamy but it was the bread with its potent aroma of butter that seals the deal, enticing the sweetness of the lobster out from under all that sauce. 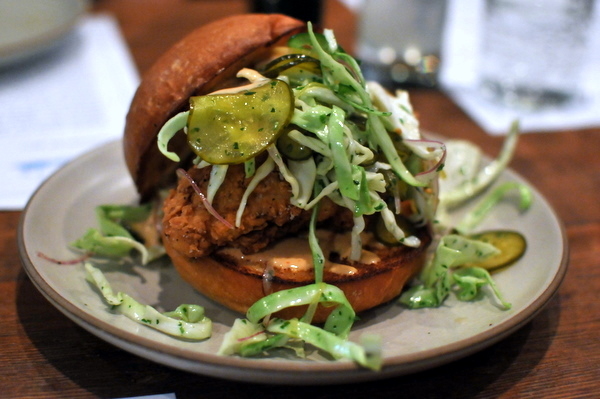 I'm a sucker for fried chicken and this sandwich just hit the spot. Reminiscent of a Chick-fil-a sandwich, the tender flavorful chicken comes coated in a beautifully crunchy outer coating while the pickles and slaw add the right amount of succulence to mask the heaviness of the deep frying. I've had shrimp toast recently at WP24, Lukshon, and now Son of a Gun and none of the preparations are alike. 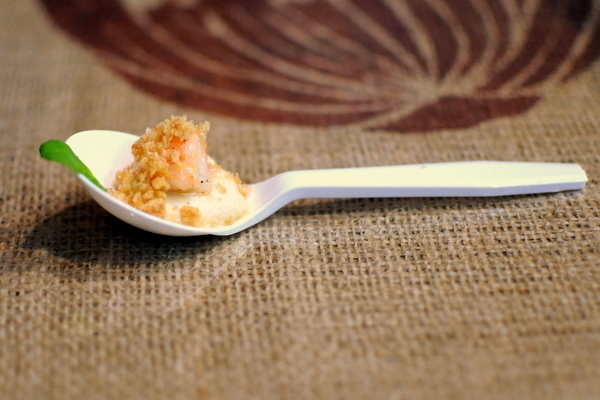 The preparation here consisted of two layers of shrimp toast, shrimp paste covered in a crunchy deep-fried crust, around a filling of herbs and Siracha. 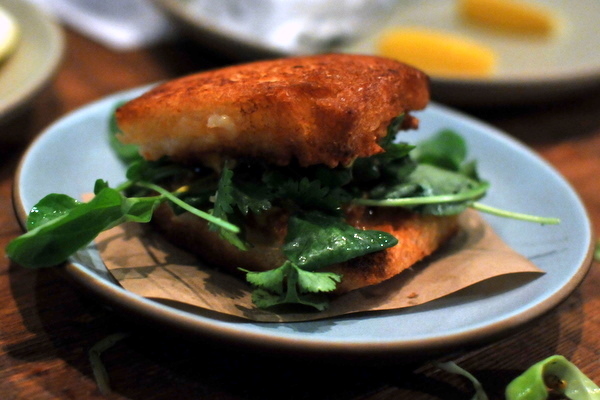 The toast had a flavor reminiscent of the Chao Tom Cuon at Brodard, albeit with deeper more satisfying savoriness. The herbs and Siracha are crucial to add contrast and balance. With the Keebler Club crackers, this looked like a snack dip that one would find at a picnic. 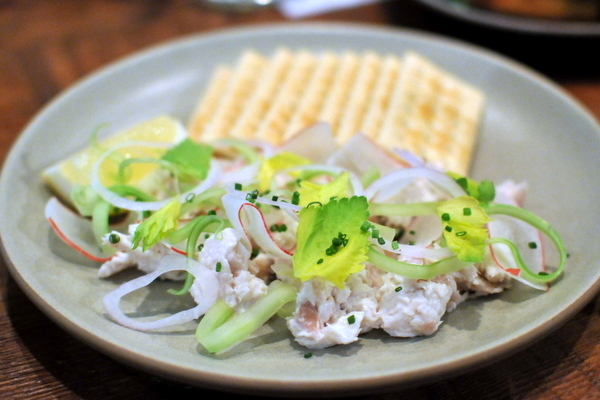 The smoked Mahi looked like store bought crab salad but the flavor was intense with a lingering aroma of wood chips. From first glance I was thinking Japanese all the way with this course and it didn't disappoint. 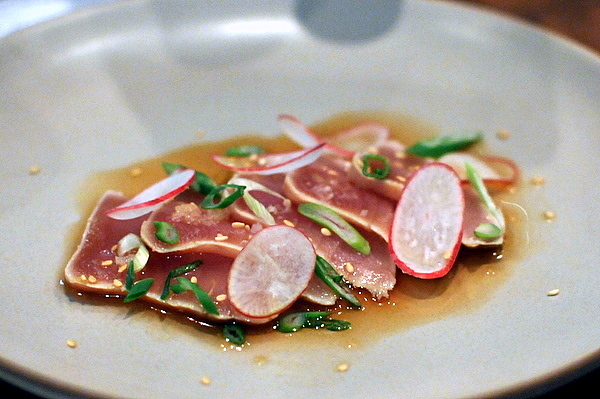 The citrus soy was a very faithful replacement for ponzu, a delightful companion for the seared Albacore. Oddly I got a powerful aftertaste of garlic on the finish. Without a doubt, this has to be one of the saltiest hams I've ever tasted. Fortunately the meat came with equally sweet accompaniments, the duo of corn bread and saccharine honey butter helped bring the saltiness down to tolerable levels. 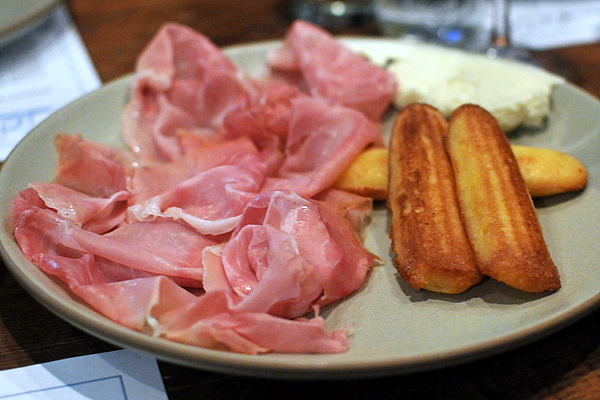 I actually enjoyed the moist spongy corn bread and butter on their own more than with the ham. 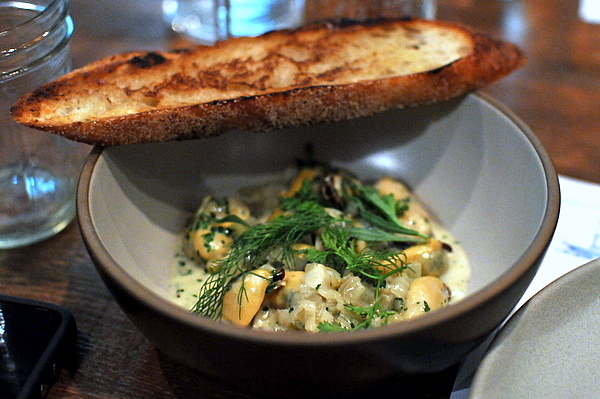 I've never been a fan of mussels, neither the soft mealy texture nor the funky flavor appeal to me. However, I did enjoy this preparation the Pernod, fennel, and tarragon add a licorice tinged aromatics that tempers the natural flavor of the mussels. Having the mussels come shelled didn't hurt matters either. I hate to admit it, but the fried alligator did taste a lot like chicken. Lean but tender, the coating of breadcrumbs gives the meat a character similar to fried chicken. The meat is beautifully enhanced with a light vanilla sauce, brilliant pairing such a soft flavor with the brazen savoriness of the gator. Fumet is a concentrated stock made from mushrooms or fish used to flavor milder sauces. Indeed the broth tasted heavily of fish sauce while the herbs and lime completed the illusion of a bowl of pho. The fish itself was a little softer than I was expecting, but still enjoyable and the mild flavor of the fish soaked up the heady stock like a sponge. 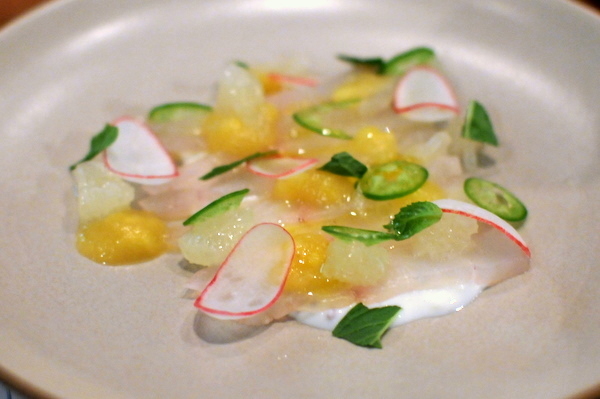 I was curious about the fluke and raita combination but it was the oro blanco that ended up dominating this course with an acidity of the grapefruit felt a bit lopsided against the mild fluke. The citrus was much more effective here, the potency of the grapefruit is countered by an equally lush sweet orange. 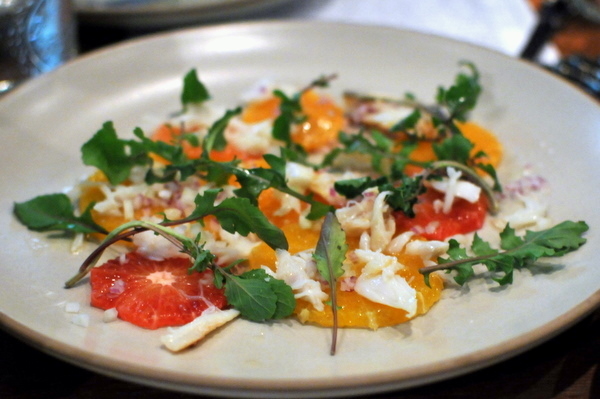 The crab was almost unnecessary as this dish focused on the citrus though the nuttiness of the arugula came through undimmed as well. I appreciated the Two Dudes' take on this classic dish. 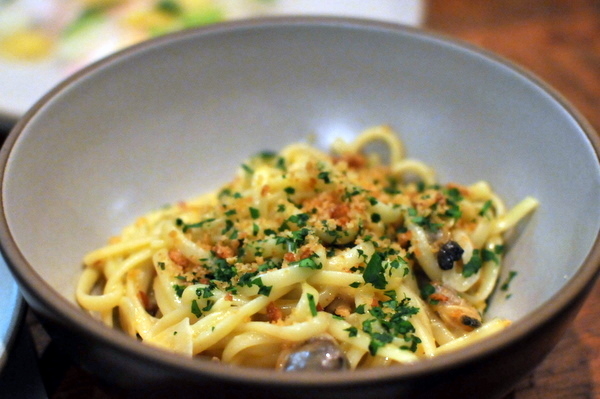 The clams add a nice hint of brine to the plump supple noodles while the breadcrumbs provided some textural contrast. I was expecting the uni to be more apparent but the flavor hovered around the edges. The oily flavor of the trout is deftly managed here by a generous helping of rich butter. Personally I could have forgone the carrot and potato and gone with the fish all by itself. Peel and eat was something of a misnomer as we all seemed to struggle a bit when removing the shell. Still the delicately cooked shrimp meat was worth the effort. 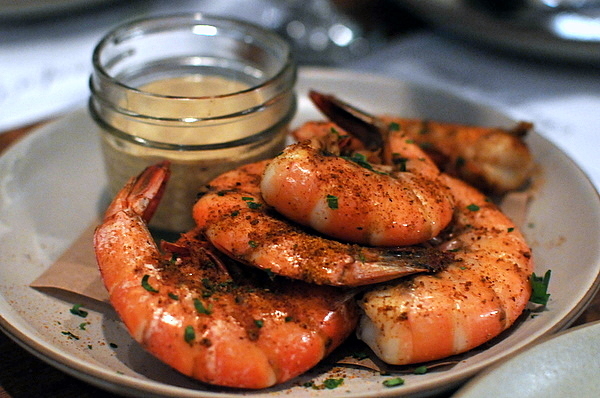 I preferred eating the shrimp without the lime mustard, enjoying the natural flavor of the shellfish tinged with a slight bit of Old Bay. Following the regular shrimp with the spot prawn really highlighted the differences between the two. 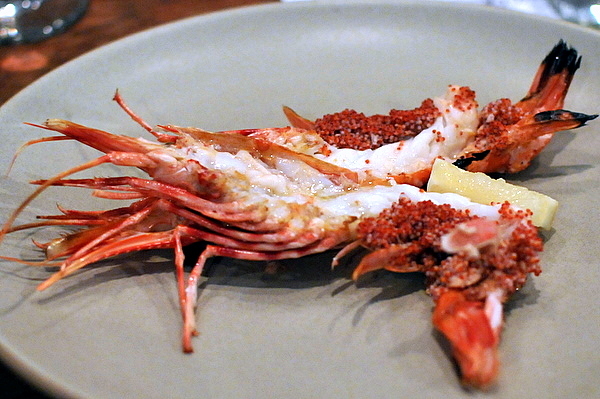 The fresh spot prawn is in a whole other league, with a succulent supple texture and essence of fresh brine the prawn didn't need any accompaniments. Another of the night's standouts, king crab, like the spot prawns needs to be served as simply as possible to enjoy the meat's natural flavor. The butter brings the crab's natural sweetness to the fore while the Tabasco adds a vinegar tinged bite that helps balance the density of the meat. I was probably a bit too full to appreciate this course. The beef itself is quite good, tender and nicely seasoned, but the Béarnaise sauce was a bit overwhelming at this point. Under other circumstances, I suspect this would be an ideal course to finish a meal. Both desserts had a deconstructed feel to them. 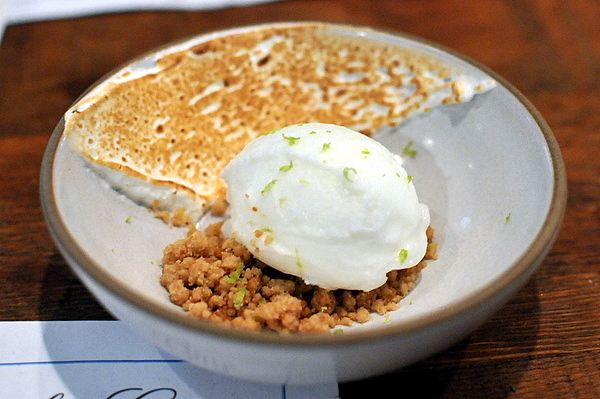 First up was a tart frozen yogurt coupled with a creamy toasted meringue and bits of rich graham cracker that faithfully recreated a key lime pie. 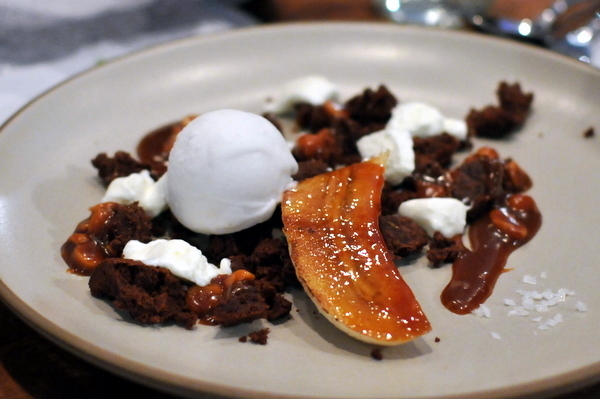 Long the purview of steakhouses, Jon and Vinnie breathe new life into a tired dessert. The chunks of fudge-like chocolate cake are balanced by a salt-laced caramel while the sweetness of the banana adds a tropical lightness to the mix. Son of a Gun offers a mix of cuisines as eclectic as its name, drawing heavily from Asian flavors for a couple of the courses, while the other dishes look like something out of a tapas joint or Southern restaurant. Shook and Dotolo manage to capture the best of each style, resulting in delicious, tightly focused flavors. I wonder what is next for the duo, personally after having the lobster roll, fried chicken, and shrimp toast, I'm hoping its their sandwich shop. Since Thomas Keller started The French Laundry in 1994, three people have held the title Chef de Cuisine. 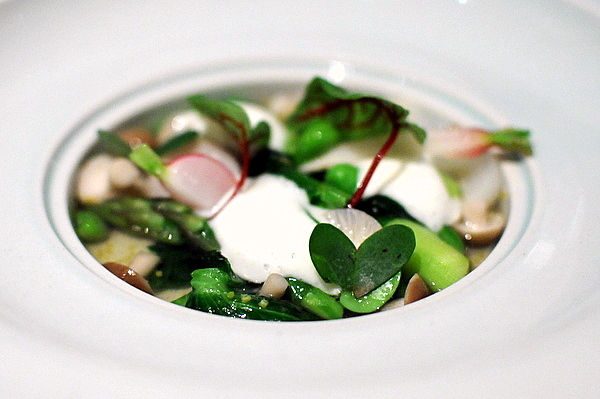 In addition to technique and skill it takes a certain amount of ambition to rise to Chef de Cuisine at the French Laundry. Though CdC at The French Laundry could justifiably be considered the apex of any chef's career, I suspect same ambition that enabled these rare few to lead one of the world's greatest kitchens also drives to leave and create something of their own. The first, Eric Ziebold left in 2004 after 8 years to open CityZen, now one of DC's most acclaimed restaurants. 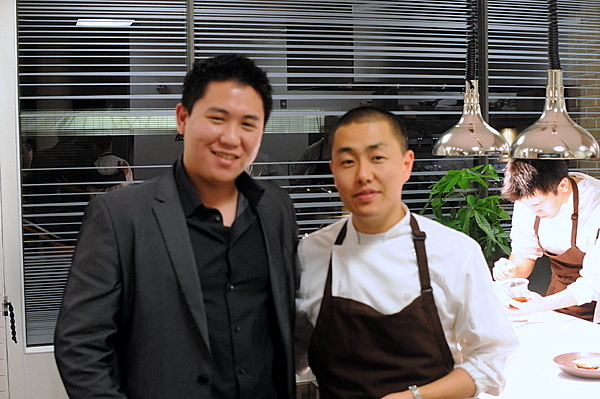 During the kitchen tour at my visit to The French Laundry in 2007, I remember wondering when Chef Corey Lee would leave to start his own restaurant. In an industry known for quick staff turnover, Chef Corey Lee has bucked that trend spending his entire career with the Thomas Keller Restaurant Group, climbing steadily from line cook to Chef de Cuisine at The French Laundry. The other shoe finally dropped in 2009 with Chef Lee's departure and the subsequent opening of Benu. 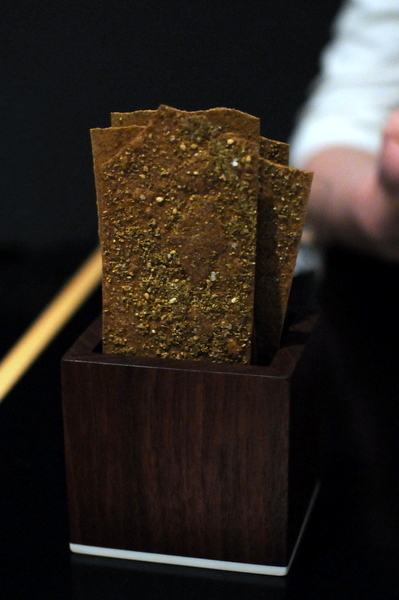 The bread is a dry buckwheat cracker that possesses a deep nutty sweetness and a hint of nori-driven salinity. It probably comes as no surprise that Thousand-year-old egg is something of a misnomer. The actual preservation process involves coating the eggs in an alkaline mixture of clay, ash, salt, lime and rice hulls to raise the pH of the egg over a period from several weeks to several months. The result is a translucent jellied exterior and an inky black yolk that carries a slightly sulfurous tang. 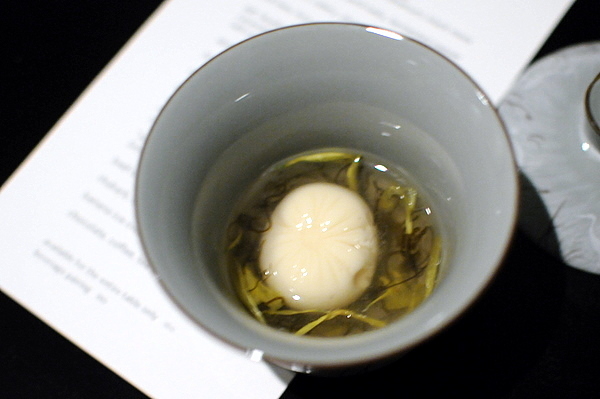 Accompanying the egg is an herbal viscous broth of chrysanthemum and black moss with a globule of incredibly dense supple tofu. 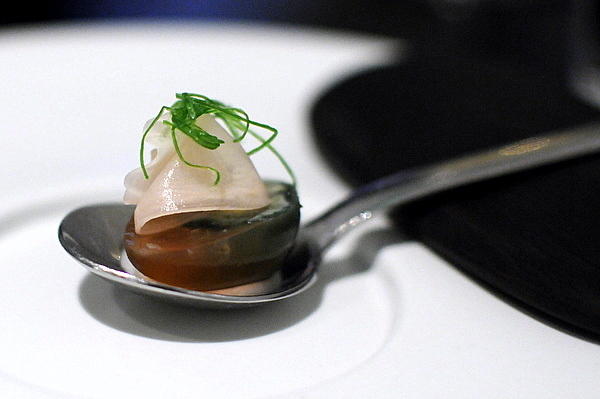 A nuanced and elegant amuse but one very keeping with the Asian flavors Chef Lee is trying to showcase. The wine is quite big for a grüner, notes of yeasty toast vie with a layer of underlying acidity. Combining oyster and pork belly can be tricky as neither is given to sharing the spotlight with an equally bold accompaniment. Though both were beautifully prepared, I thought the two stepped on one another resulting in a muddled flavor instead of the crisp brine and decadent unctuousness they normally display. The combination of the cabbage and fermented pepper reminded me of a mild kimchi which went exceedingly well with both proteins in the dish. The grüner with the previous course was even more effective with this the dichotomy paralleling the clash of the oyster and pork belly. Chef Lee must have been channeling his inner Gagnare with this course because this cerebral melange would have been right at home on the menu at Twist. 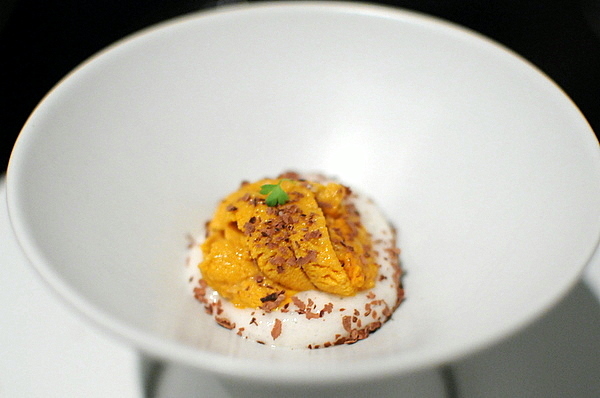 The result of mixing uni with celery and chocolate is an entirely unique flavor profile at once earthy, dusky, and bitter as well as sweet and briny and that's without factoring the fresh vegetal crunch of the celery. An impeccably constructed course, the duet was simply a bit disconcerting for my tastes. The name Demon Slayer belies the refinement of this sake, incredibly mild with a silky smooth and slightly viscous texture. Lees refer to the deposit of dead yeast that remain at the bottom of the vat during fermentation. Bottled wine directly on lees without filtering is supposed to add a nutty toasty note. 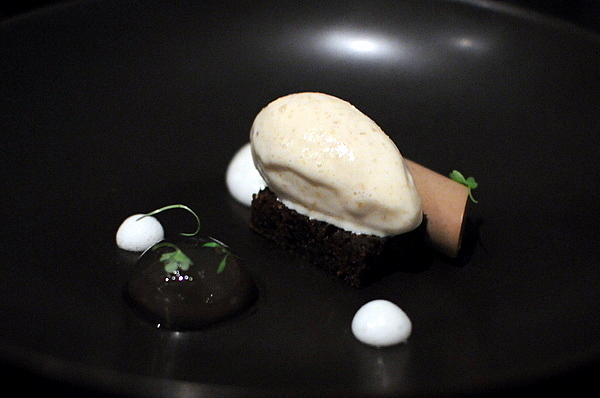 This dish centers around an "ice cream" made from sake lees, yeasty with a milky grain sweetness. The foie is presented as a pudding, the characteristic richness is present but elusive; always just on the edge of my consciousness. 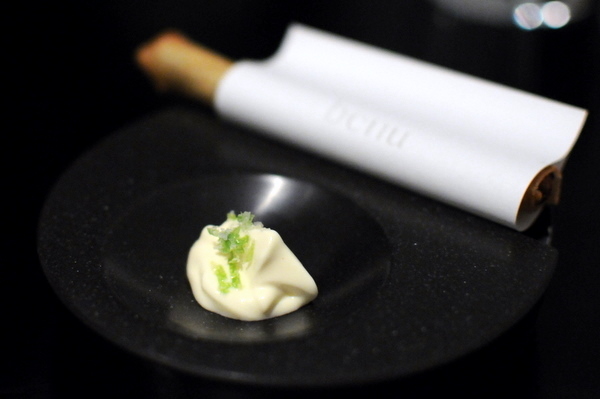 The course is finished with a delicate yet effusive aroma of yuzu. The sake pairs especially well with this course, the flavors of the lees helps accentuate the sake's rougher edges. 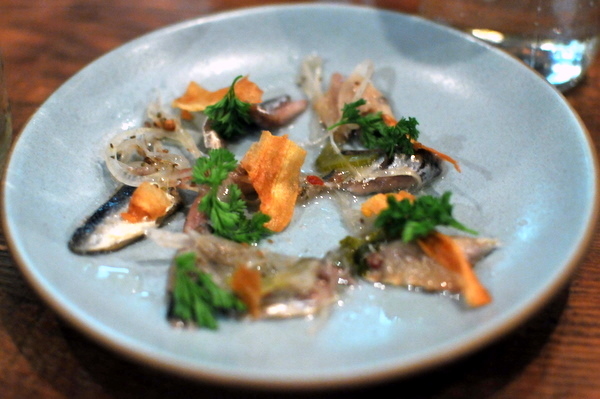 This course was described as Chef Lee's play on izakaya fare. 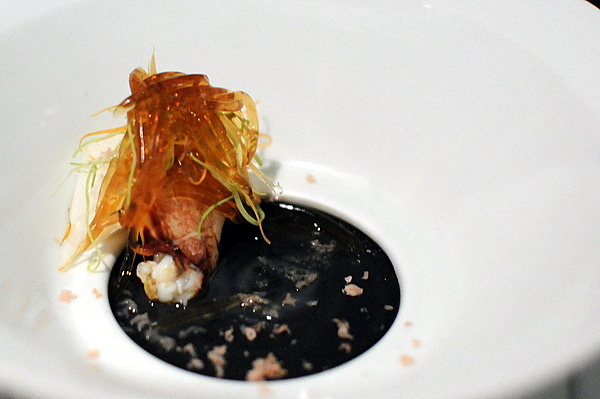 The first course was reminiscent of an eel spring roll. The flavor of the gelee was more like a beef consomme, mild and slightly nutty, nothing like what I was expecting for a liquefied anchovy. 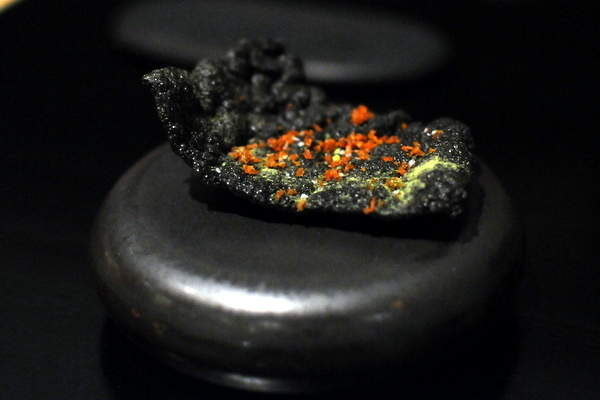 The final course was my favorite of the trio, a salt and pepper squid "chip" that has a slight molecular feel about it. Salty, briny, and slight bit of heat replicate the key flavors of a salt and pepper squid with a crisp texture reminiscent of shrimp chips. This course continues the unconventional pairings and what would be more appropriate to pair with izakaya fare than beer. I've always enjoyed witbiers and Kiuchi's is an especially bold and focused example, the aromas of citrus and coriander are quite powerful, though the palate contains a slight malty sweetness. The meal shifts gears with this course, going from avant garde small plates to a more traditionally structured course progression. 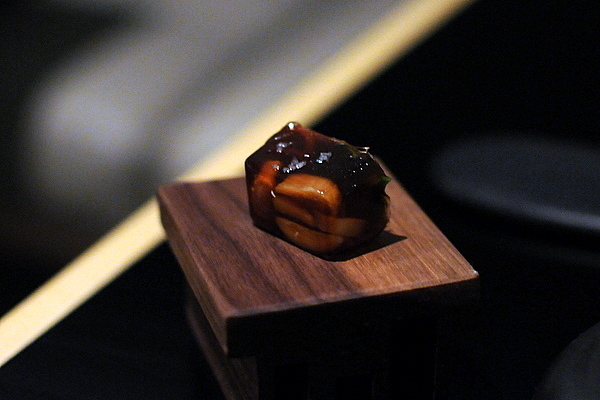 First up was a beautifully caramelized abalone, immensely sweet with a texture that starts out tender and supple but gets firmer towards the mollusk's center. Grenobloise means "of Grenoble" and refers to a city in southern France; dishes labeled with this designation incorporate a combination of brown butter, capers, parsley, and lemon. 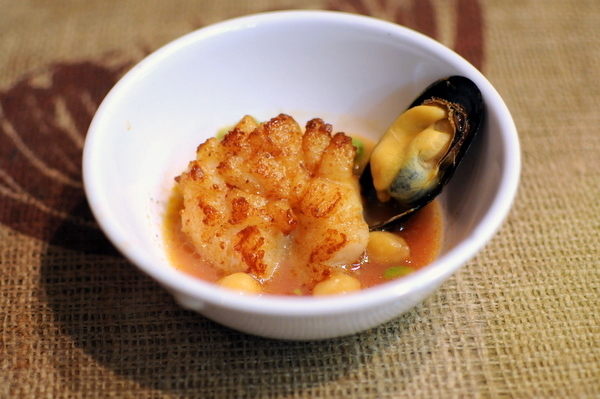 With this dish, the admixture simultaneously enhances the shellfish's natural sweetness while adding a multifaceted tartness. I tend to struggle with Sauvignon Blanc, but this was a fairly straightforward glass, mineral notes on the attack evolve to pineapple and tropical fruit on the finish. The melange of vegetables includes peas, asparagus, radishes, greens and mushrooms as well as other unidentified vegetables. The distinct flavors and textures create a riot of sensation that is softened and unified by umami overtures from the dashi. 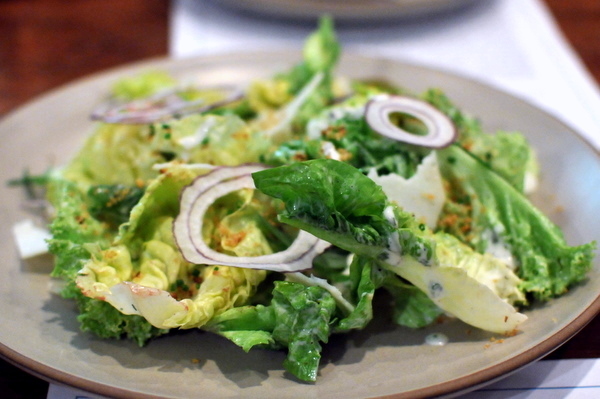 The tangy funk of the Parmesan contrasts with the vegetables and emphasizes their simple elegance. Interestingly the Sauvignon Blanc exhibited more grassy tones when taken with the vegetables. Given the similarities between ankimo and foie gras, I was expecting something along the lines of the exquisite foie gras torchon at French Laundry, which to this day is still my favorite foie gras preparation. This didn't have the creamy mouth feel I was expecting, instead the texture was slick, refined, almost like a gelatin. 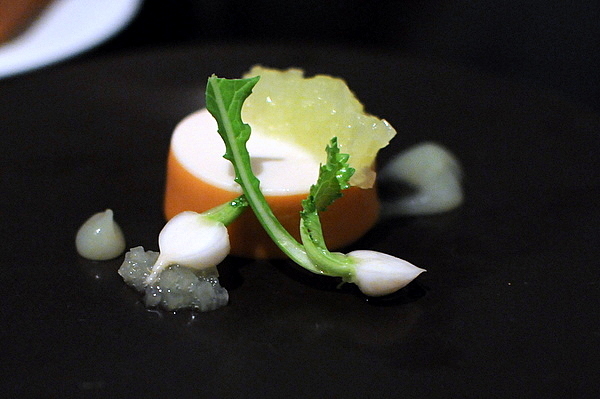 The flavor was similarly restrained with only a trace of the characteristic flavor of the monkfish liver. This reminded me of something out of Red Medicine or Lukshon, the dish is a celebration of the subtle nuances of green curry. Typical green curry consists of coconut milk, green curry paste, aubergine, fish sauce, Kaffir lime leaves, and Thai basil, the result is a lovely ballet of spice and sweetness; shame that the lobster gets lost in the mix. The accompanying wine offers a complex bouquet, tightly wound acidity evolves a slight hint of fruit over a bed of flinty chalky minerality. I've been enjoying vegetable risotto more and more, the peas give the rice a vegetal cast which helps counter the ample weight of the cream. The interplay between the black truffle is particularly delicious so much so that I could have done without the sea urchin at all. 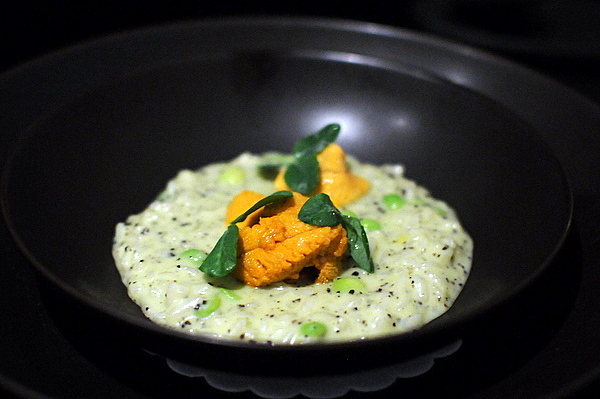 Still I appreciated the velvety feel of the urchin roe and the delicate brine it brought to the table. 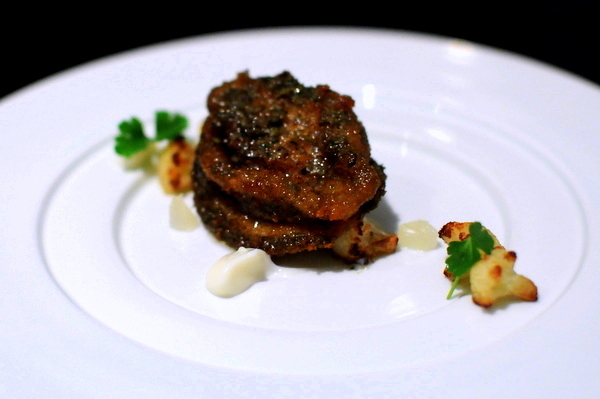 This is one of Chef Lee's signature dish and has been on the menu since the restaurant opened. The soup actually does not include any sharks fin, simulating the shredded cartilage with a mix of gels designed by a chemist in San Diego. 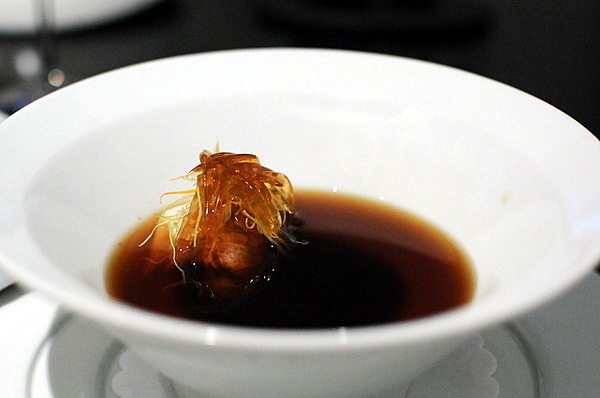 The soup is a consommé of Jinhua ham which also one of the key ingredients of the broth in traditional preparations. 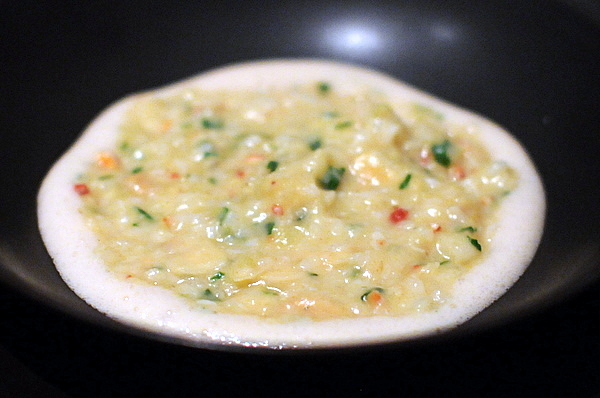 Crabs also feature prominently as a flavoring agent in many preparations of shark's fin soup. 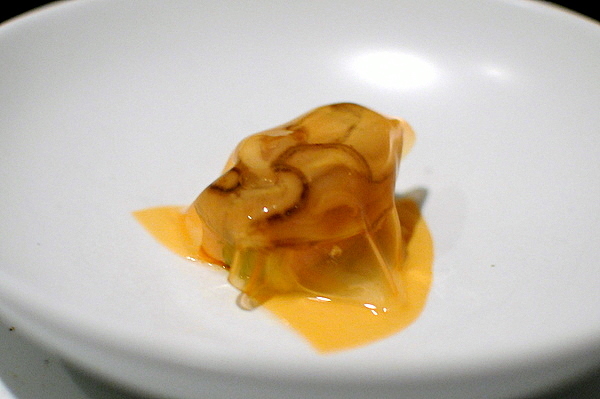 The black ooze at the bottom is not an homage to the recent BP oil spill but a black truffle custard and the only non-traditional ingredient in the dish. The staff stresses this course is NOT a traditional sharks fin and those who go in expecting that will be disappointed. Despite the warning I couldn't help making comparisons between the two. Unfortunately the synthetic shark's fin doesn't exactly capture the snappy texture of true sharks fin and the Jinhua ham soup is more one dimensional than the thick stock of "gao tong" or high soup normally used. At the same time I was thoroughly impressed at the sheer brazenness of this dish, taking a time-honored classic and recreating it with Chef Lee's personal stamp. Who knows, with a proposal to ban the sale, possession, and distribution of shark's fin in California, this may be the closest people in San Francisco will get to tasting this delicacy. The 1968 Blandy's was an able substitute for the traditional aged cognac pairing; intensely complex, the Madeira offers everything from dark complex spice and earth to caramel and dried fruit and citrus. Super tender and fatty, this beef reminded me of a Japanese Wagyu even though true Japanese Wagyu has been unavailable in the states following the discovery of foot and mouth disease in the Miyazaki beef stock back in mid-2010. Naturally beef of this caliber could stand on its own with ease but the Asian pear used to braise the meat cuts the beefy richness with a sweetness reminiscent of cha shu. Slivers of the vegetable help to further temper the weight of the meat while the thick chewy date delivers a smack of ripe red fruit. The course came paired with a CdP that had just enough body to stand up to the beef, the wine was quite expressive with notes of ripe fruit as well as aromas of herbs, saddle, and even some soft spice. 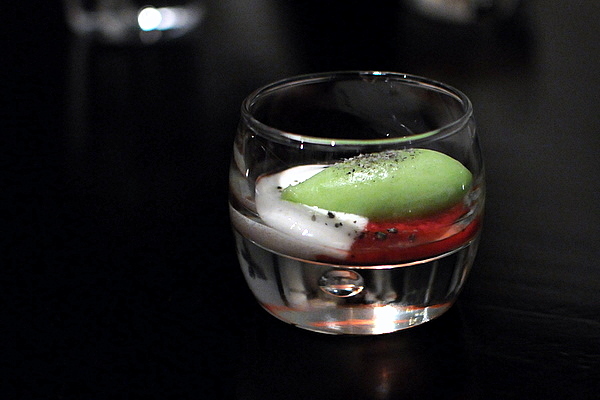 The white sesame sorbet is nothing short of splendid, a lovely exposition of sweet nutty interplay that contrasts the tart rhubarb, while the cucumber imparts an almost savory like component to the palate cleanser. With the potential extinction of bananas at hand I have resolved to eat more of this most loathed fruit while I still can. The ice cream was actually quite enjoyable sort of like a semi-liquid banana nut bread. The ginger managed to give the dish a warm soothing feel despite large parts of it being frozen. 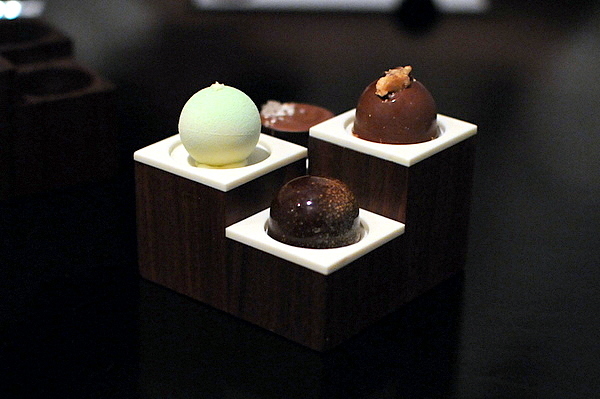 The final course consisted of four house-made truffles, green tea white chocolate, sesame sea salt, walnut milk chocolate, and dark chocolate with espresso ganache, a delicious way to end the meal. 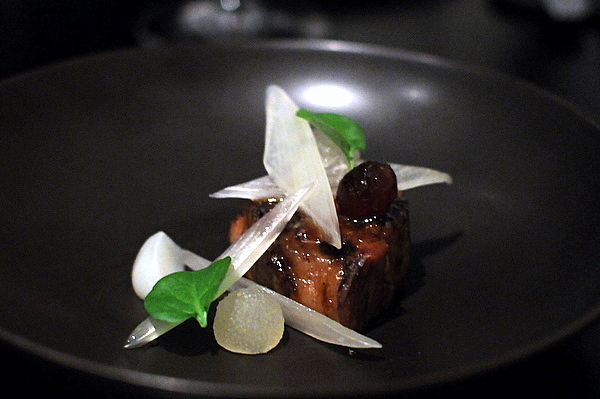 Benu was one of my most anticipated meals in a while and so I approached it with extremely high expectations. Though not every course Those expecting an experience similar to Laundry will be disappointed. Instead Chef Lee draws heavily on his own culinary heritage while maintaining the attention to detail and exacting standards that are a hallmark of his time at Laundry. 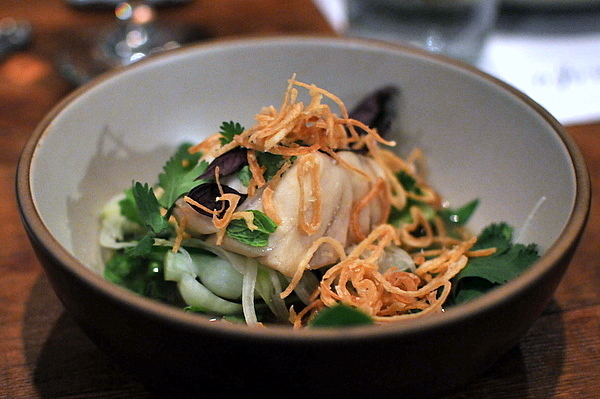 Certainly Eastern influences abound, but the term "fusion" seems too coarse and inelegant to describe his cuisine. In fact, Chef Lee's food defies traditional quantification; intricate and deliberate, every piece on the dish has a role to play. 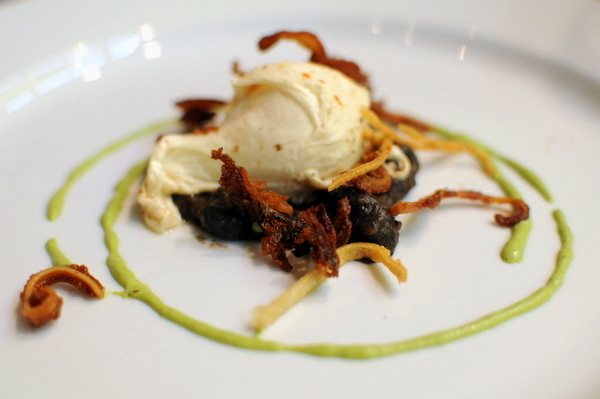 The early courses felt more cerebral and adventurous and the later dishes were more satisfying on a sensual level. 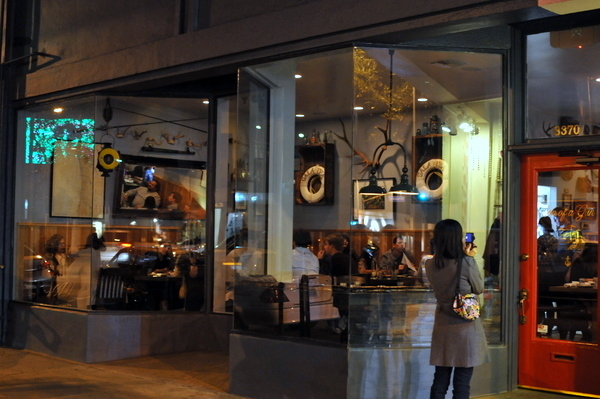 Magnum is the pop-up restaurant of Joseph Mahon and David Haskell. The duo previously paired up for a two-day stint at Biergarten in December of last year. 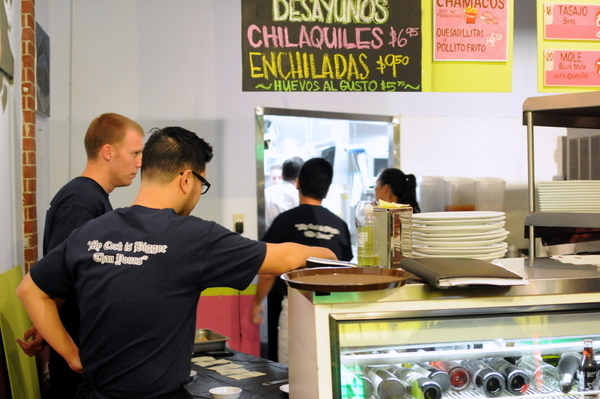 This time the two have taken over Pal Cabron, another K-town eatery known for their Cemitas and Clayudas. 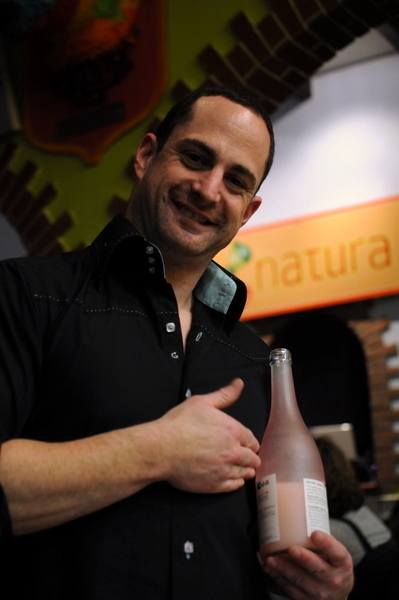 Chef Mahon who got his start in New York at places like Cafe Boulud, Danube, and Bouley, was previously head chef at Bastide. Running the front of the house is David Haskell most recently of Vertical Wine Bistro; brash and outspoken, Haskell doesn't take himself too seriously despite having worked at the likes of Le Cirque in New York and Guy Savoy in Paris. 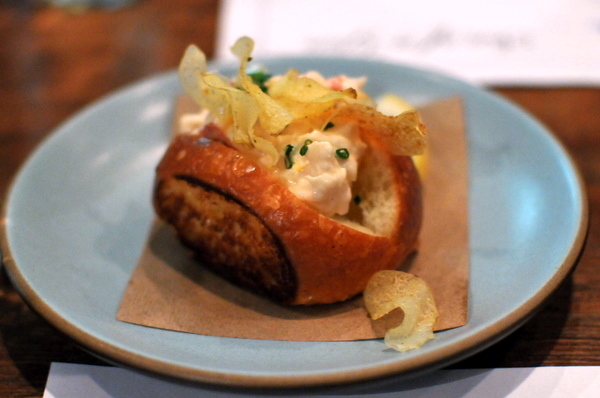 A pleasing start to the meal, the duet of onion and apple provides a creamy savory sweet base that in conjunction with the chicharones reminded me of a Funyun while the poached shrimp adds a bit of textural muscle to the bite. The first course was a pazole, which despite its thin brothy feel, was intensely peppery, savory and satisfying thanks to the generous slab of tender fatty pork. The fresh bright mint and light citrus accompaniments both contrasted nicely with the weighty essence of the soup. 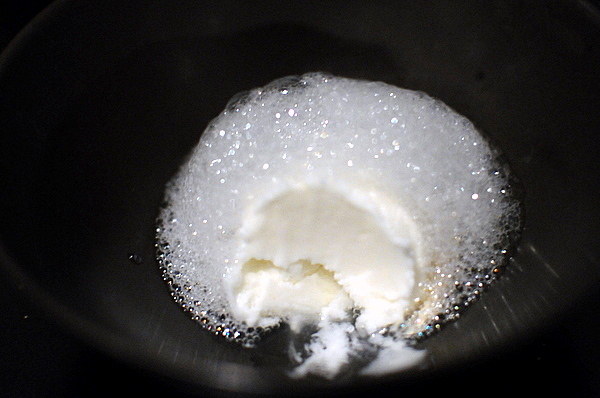 The accompanying wine, a dry Italian white which Haskell likened to an unrefined milkshake, developed a flavor reminiscent of blue cheese when taken in conjunction with the soup. 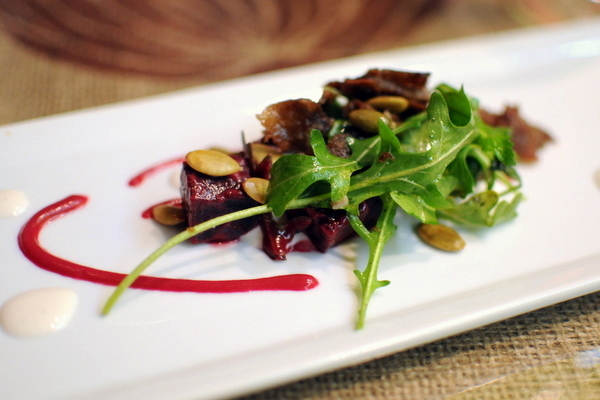 Though I'm not normally a huge fan of beets, I find they do better when paired with something to attenuate their saccharinity; in this case, crispy veal tongue. 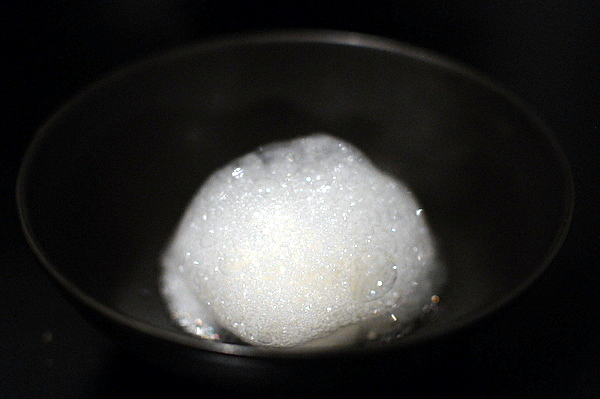 In addition to the resultant salty sweet flavor profile, the contrasting textures play off one another beautifully making this course more about sensation than taste. Fatty, supple and bursting with flavor, this was simply a beautiful diver scallop. The acidity of the tomato and creaminess of the avocado provide complexity and contrast while the mussel refocuses attention on the shellfish. 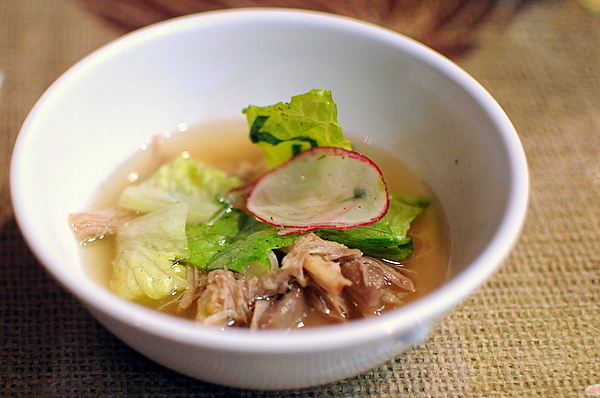 The wine was a refined prosecco that built nicely on the tang of the broth. It is rare that a table of foodies comes to a consensus regarding a dish but we all likened this course to shrimp cocktail, but I suppose it was to be expected given the primary ingredients in cocktail sauce are ketchup and horseradish. 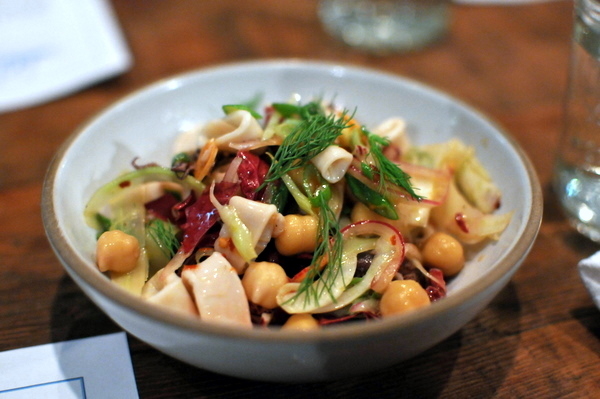 The key to this dish was the cabbage which brought a crisp succulent levity to the dish. Haskell described his frustration at having to pair wine with horseradish and ketchup, but I thought the minerally pinot he selected did the job admirably. To create his version of the cemita, Chef Mahon applying French techniques and flavor to the popular Mexican street food and the marriage couldn't be better. The foie remains the star of the dish but the bitter char of the bread and smoky sweet sauce both add balance and depth, a thoroughly fun and delicious course. The Mezcal was a wonderful addition as well, all woody and rustic tones, such a contrast to the refined character of the cemita. Hard to go wrong with eggs, pork, and beans. Each element in the troika brings something distinct to the table: the beans offer a dark smoky heft and heavy starchy texture, the egg tempers the texture with a rich silkiness, and the pig ear adds a crispy porcine sapor. My only complaint was the ears were a bit overdone. 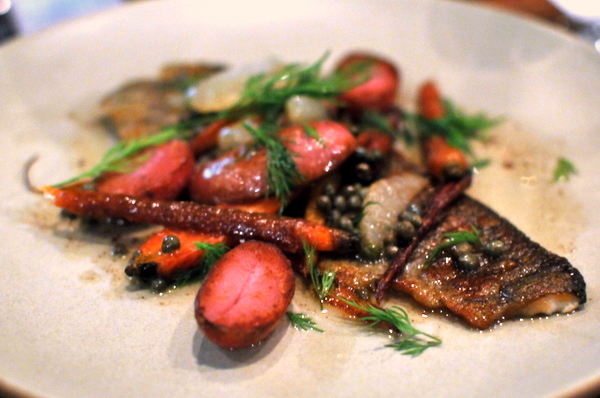 Squid and sausage are simply a match made in heaven as my recent experience at Lukshon will attest to. The duo produces a wonderfully nuanced salty brine that stands nicely on its own. As Haskell promised, the wine takes on a maple syrup like character, the missing element in the squid and chorizo "McGriddle." 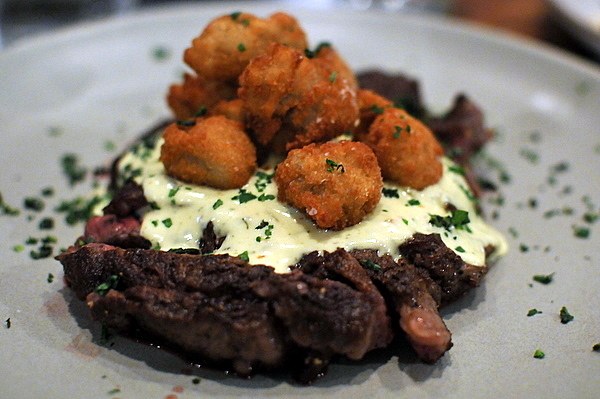 Our final savory was a flank steak that felt very Ludoesque to me. The meat possesses a nice coarse grain and full-bodied beefy char. 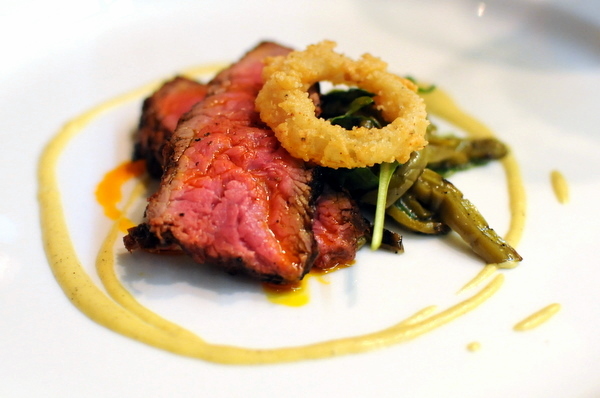 Paring the cactus was a masterstroke, its unabashed smoky flavor was the perfect addition to the rustic flank steak. 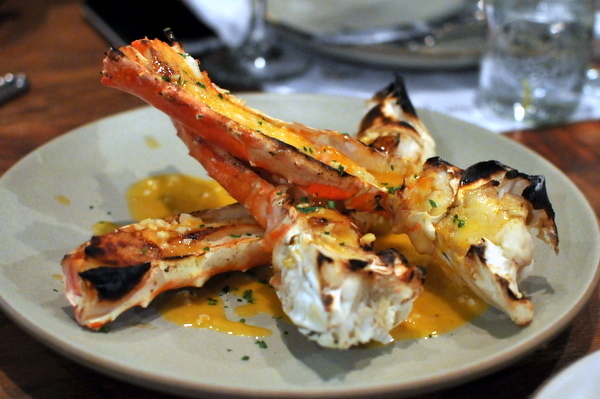 Meanwhile the grilled corn sauce adds a fragrant sweetness reminiscent of vanilla ice cream. The wine was a fruit-driven easy drinking Sicilian red that Haskell likened to a "blueberry sauce" for the beef. 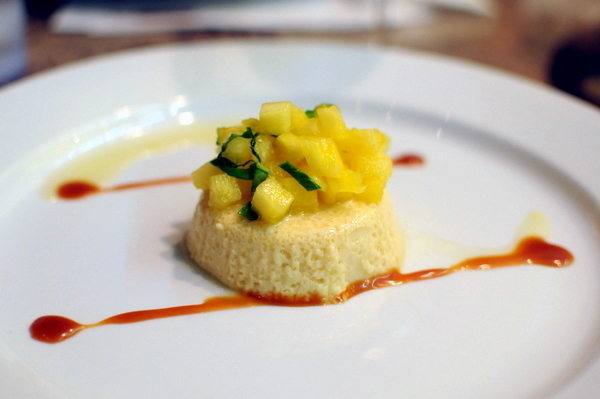 Fitting to close the night with a flan course. The consistency was just the way I like it; creamy, not to firm with a straightforward flavor of caramelized sugar accented with fresh pineapple and mint. As the final wine of the evening the Nigori Sake was supposed to bring the pairings back to the milkshake theme that was established with our first pour though anytime Haskell pours something milky its hard not to wonder at the dubious origins of the drink. 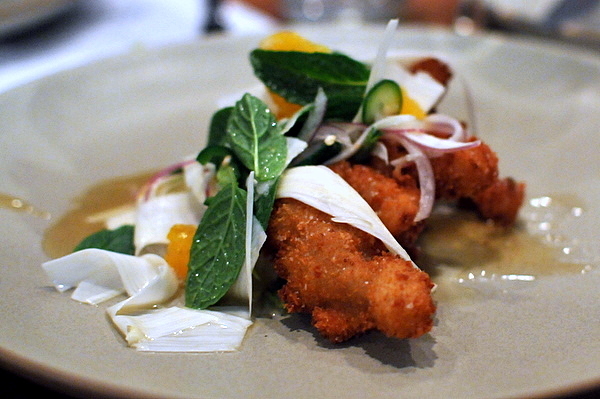 As with the previous iteration, Chef Mahon incorporates elements of the host restaurant into his dishes and the ensuing fare was both inventive and delicious. Meanwhile Haskell, as he is wont to do, tells a story with his wines, resulting in a progression that is far more thoughtful than most. I wasn't sure what to expect with Magnum but I left quite satisfied and am eagerly waiting to see where they pop-up next.